ANSI Common Lisp , by Paul Graham, is a great introduction to Lisp. Lots of compelling examples on run-length encoding (see previous post), poetry generation and ray-tracing. This post looks at translating the example (from Chapter 9) into Clojure. "To generate a 3D image, we need to define at least four things: an eye, one or more light sources, a simulated world consisting of one or more surfaces, and a plane (the image plane) that serves as a window onto this world. The image we generate is the projection of the world onto a region of the image plane." So how do we generate the pictures? That's pretty simple too, all we do is for every pixel in the image plane just trace the ray that the eye would see from there. Done. We start off by defining some simple maths functions and an object to represent a point in 3D space. The original Lisp code mixed the point structure with individual values. I felt this made the code a bit ugly and hard to read, so in here we try to use the point structure as much as possible. (struct point 1 2 3) feels like clunky syntax, but I was unable to find anything better. Perhaps an alternative is to just use a plain vector / map? Or wait for the future and see if struct support improves? Anyway, the code above is self explanatory, minroot is the big one and that's just a solver for the quadratic equation. function. Next we need to define some of the environment. For this we'll fix the image plan between (0,0) and (300,300) and we'll just render spheres. Each surface has a grey-scale colour associated with it (a surface). One thing I did find was that Clojure doesn't support the :include for structs that Common Lisp does. 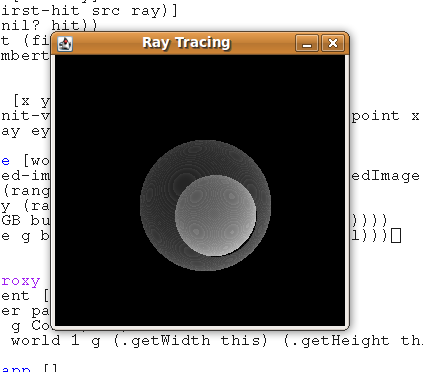 For this example, the world is a couple of spheres one smaller than the other and in front (and slightly brighter). The following functions determine where a sphere gets hit with a ray from a specific source (in this case a point) and the surface normal of a hit. That's it for the machinery to actually generate the image - now we need some UI and something to actually draw it. The original code generated a PPM format image, but since Clojure has a decent UI toolkit with Swing, let's just render something in a Window instead. The UI just uses the "canvas" idiom I used for the bubble sort application. The only major difference between this and the ACL code, is prefering to use map and reduce instead of the nested do code. This feels more functional to me and also opens up parallelism opportunities which I'll look at for the next post. So what does it look like (not very good, but a background of code looks cool!)? How would you rate the performance of clojure compared to java (or scala) in the context of ray tracing? Hi Joshua - thanks for commenting. Clojure, Scala and Java all ultimately compile down to Java byte code so they should have similar levels of performance (within an order of magnitude I'd guess). None of the Clojure code in this is type hinted in any way, so I expect it to be pretty poor speed-wise. Compiling the Clojure code with warn-on-reflection and adding the type hints should give a juicy speed up. From the second post, it definitely seems very easy to scale. I really enjoy Scala and know it's pretty fast from personal use and its almost on par for Java performance. I've had a really hard time finding any Clojure benchmarks compared to Java, so I was just wondering how slow it is relatively. I'd be happy with it being half or maybe even a tenth, but I was just wondering if it performed more like JRuby than Scala. It definitely looks fun to code in.